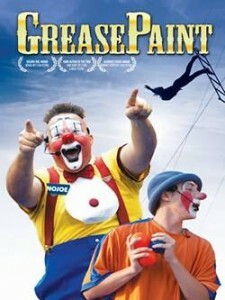 The 2013 documentary GreasePaint follows Nojoe’s Circus, a first-generation, Georgia-based family run circus, as they travel around the country for one season. It is produced and directed by Daniel Espeut, a first-time feature filmmaker who has done an amazing job. Espeut was able to capture all the tensions and joys that family patriarch Joey Thurmond, his wife Jamie, their son Tyler, Taylor (Tyler’s girlfriend), and their aerialist Hernan Colonia, experience as a circus family that’s together 24/7. And it appears to be a very honest portrayal (warts and all) of all the members of the circus. Joey is an extremely charismatic and affable person. I was engrossed in the story of his progression from pro wrestler, rodeo cowboy and cop to pursuing his dream of being a full-time clown. (He reminded me of that favorite cousin everyone wants to sit next to at Thanksgiving because of their amusing stories.) Even when the tensions are high, you can still feel his passion for his family and for entertaining the crowd. No matter what your job may be as a performer, it boils down to the audiences’ reaction—whether there are 5 or 50 people in attendance at the show. 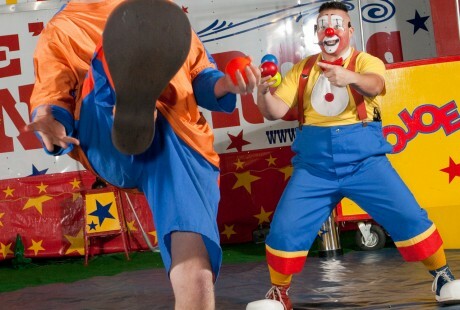 Joey’s circus strove hard to overcome whatever problems had incurred and “go on with the show” for the audiences’ sake. GreasePaint is edited very well, interspersing Joey’s story with interviews from various well-known clowns in the business. They gave perspective on what it means to be a clown as an entertainer. I’ve never been a big fan of clowns, but after screening the film, I came away with a new respect for how hard their job really is. The next time I see a live show (regardless of subject matter) I will definitely react and applaud more than I would have previously. I know the performers will be grateful. Jenna Miller studied theater and is a huge film buff. She has been regaling her family with her reviews since elementary school.